This Wednesday, 2nd December, sees the release of the latest issue of the Tenth Doctor's ongoing comic book adventures from Titan Comics. 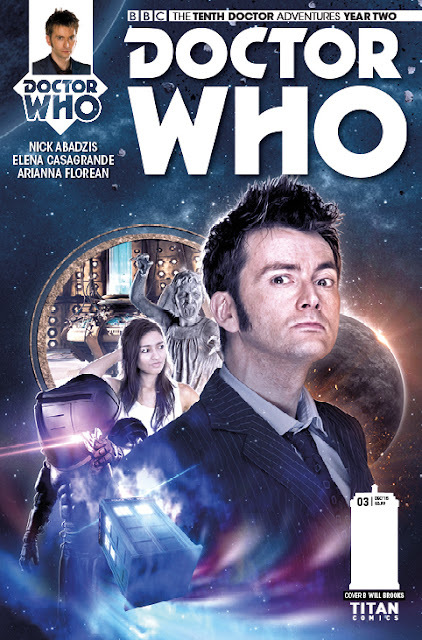 Year 2 Issue #3 checks out what the Doctor's companion Gabby's best friend is getting up to in her absence. As usual there's a selection of covers to choose from, by artists Leonardo Romero & Debora Carita, Will Brooks and Rachel Smith, and you can also get a sneak peek at some of the artwork below. Gabby's best friend Cindy remained on Earth at the end of her last adventure with the Doctor – a decision Cindy immediately regretted! Now, with only Gabby's sketchbook of unseen adventures to guide her, she must find her way back to the Doctor... but sinister forces already have her under surveillance! Grab your copy at your local comic store or online here from Wednesday. 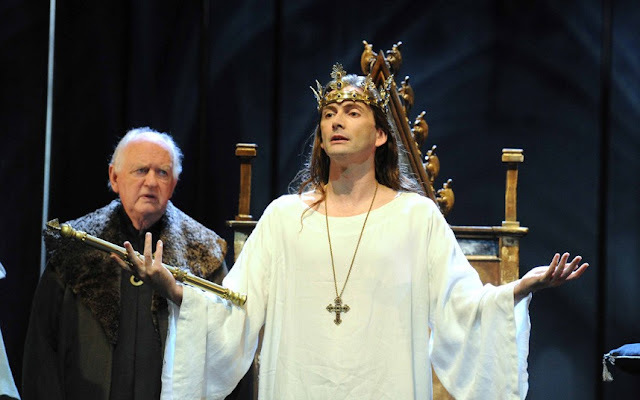 Single tickets for performances of William Shakespeare’s Richard II starring David Tennant at the Brooklyn Academy of Music go on sale to BAM Members today along with all other events from the 2016 Winter/Spring season. Until now, tickets could only be obtained as part of a season subscription for a minimum of 4 events from the programme. Richard II will be staged next spring when the Royal Shakespeare Company's tetralogy King and Country: Shakespeare’s Great Cycle of Kings transfers to the USA following a winter run at the Barbican Theatre in London. Both seasons of the acclaimed UK drama Broadchurch will be rerun on weekday afternoons on subscription channel WOWOW Prime in Japan starting from tomorrow at 12.00pm. David Tennant and Olivia Colman star as the police detectives leading the hunt for the killer of a young boy in a small seaside town. The series explores the impact of the crime on the close community, a theme that continues into the second season as the culprit goes to trial. 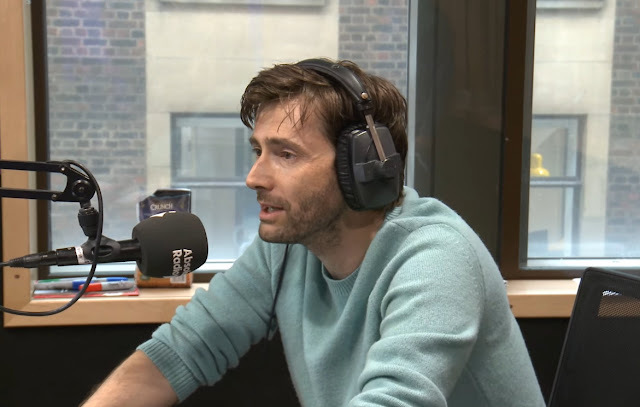 David Tennant has just called the Absolute Radio Breakfast Show this morning to find out his role in the show's Christmas Panto. In homage to the newest big screen addition to the Star Wars franchise, this year's Panto is titled Star Clause: Snow Hope, with host Christian O'Connell himself as Han Solo, Richie Firth as Chewbacca and Faye Carruthers as Princess Fayea. 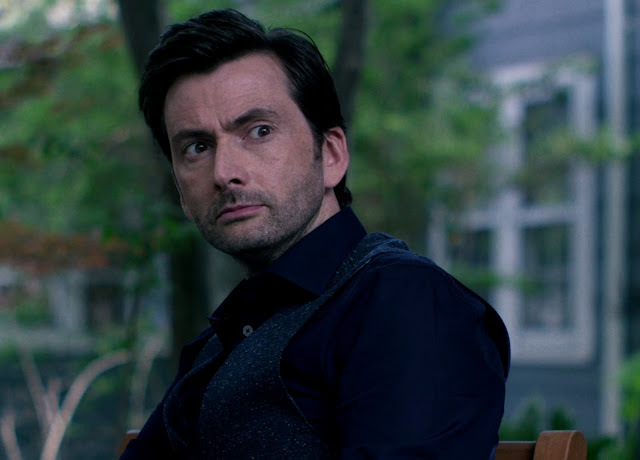 Encouraged by David's performance as bad guy Kilgrave in the new Netflix series Marvel's Jessica Jones, Christian suggested to David that the ideal casting for him would be as the evil Darth Vader. Or should that be Darth Tennant? DaVader...? You can hear the Christmas Panto as it's performed live on the show from the Leicester Square Theatre on Friday 18th December from 6am. Don't forget to listen in tomorrow to find out how you can win tickets to be there on the day! 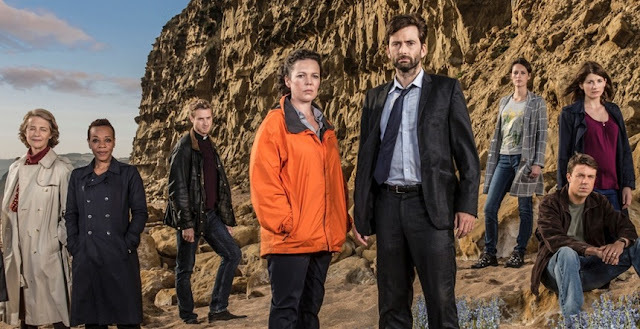 The second season of the award-winning ITV drama Broadchurch premieres on pay-TV channel 13th Street in Germany tonight. The eight-part series sees the return of David Tennant and Olivia Colman in the roles of Alec Hardy and Ellie Miller and will be shown across the next two weeks. Where season 1 dealt with the investigation surrounding the murder of young Danny Latimer and the impact of the crime on his family and the wider community, the second season focuses on the trial of his killer. Running parallel to this is another investigation, led by Detective Alec Hardy, into a troubling and unsolved case from his past involving the abduction and murder of two young girls. And although the investigation into Danny's murder has turned her life completely upside-down, Ellie Miller joins Hardy to work on this mystery when he begs for her support. 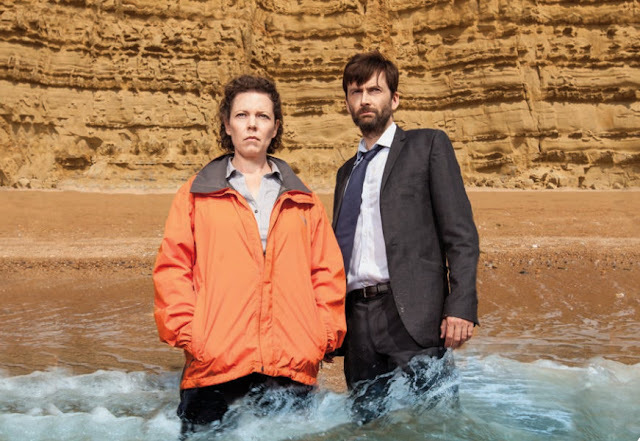 Ahead of the German premiere of Broadchurch Season 2 on 13th Street on Monday, the station are giving viewers a chance to go back to were it all began and recap the story so far. From 20.15 tonight they will be running a full Season 1 marathon of the award winning UK drama that has captivated audiences worldwide. 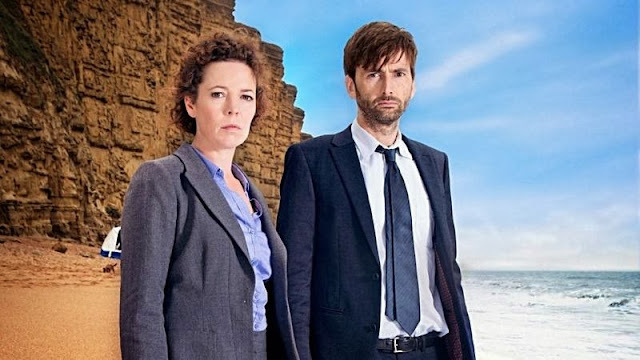 David Tennant and Olivia Colman head up an ensemble cast as Alec Hardy and Ellie Miller, the two police detectives leading the hunt for the killer of a young boy in a small seaside town. The hunt for the killer of an eleven-year old boy begins in a small town in this whodunnit thriller. A previously harmonious community is shattered by the terrible crime. David Tennant and Olivia Colman star with Arthur Darvill, Jodie Whittaker, David Bradley, Andrew Buchan and Pauline Quirke. 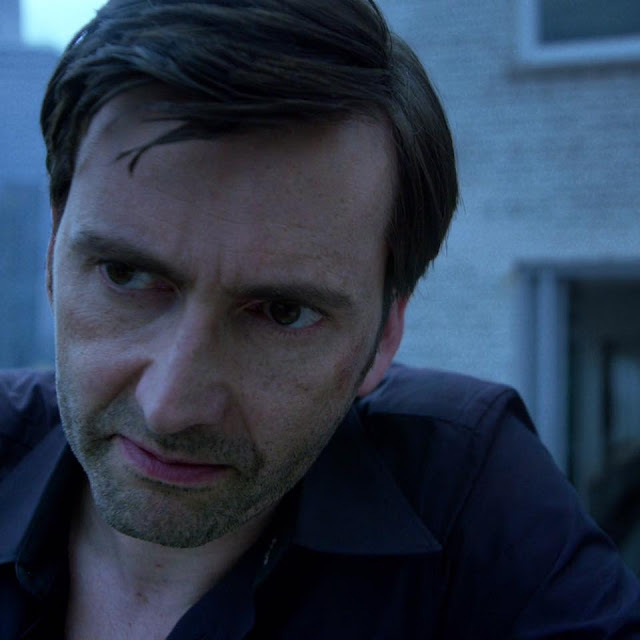 Marvel's Jessica Jones showrunner Melissa Rosenberg has nothing but praise for David Tennant who stars in the series as Kilgrave. In fact, the creatives enjoyed his portrayal of the nefarious villain with the power of mind control so much that they wrote in as many opportunities to see him perform as they could. "He's one of the finest actors I've ever had the pleasure of working with. He brings so much to what he does on so many different levels. We ended up having these full monologues, pages of dialogue for him, just because we wanted to hear him do them!" You can read the full article on Marvel's Jessica Jones in the current issue of SFX magazine, out now. 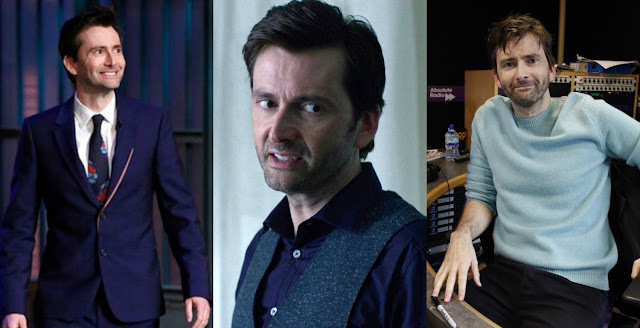 Don't forget to cast your Vote for David Tennant who is up for a 2016 People's Choice Award. David has earned his second nomination in the awards, this time in the Favourite Sci-Fi / Fantasy Actor category. The American awards are voted for by the public and recognise popular culture over a vast selection of categories within a huge range of entertainment genres. Other stars of the Sci-Fi / Fantasy realm contesting the award in David's category for the 2016 vote include Sam Heughan, Ian Somerhalder, Misha Collins and Jensen Ackles. The winners will be announced on Wednesday 6th January 2016 and will be televised on CBS. 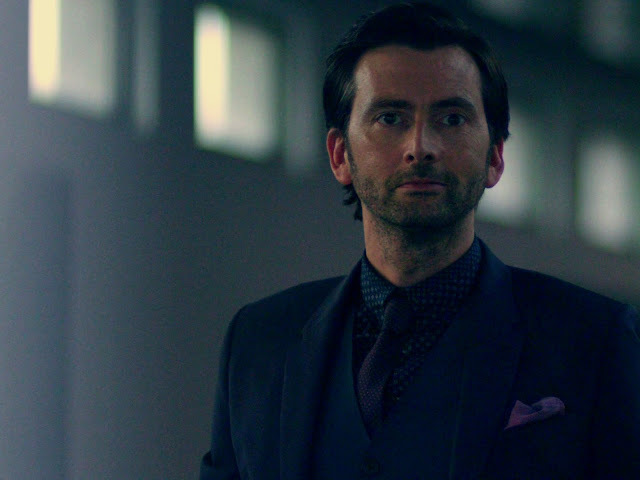 David Tennant can currently be seen in Marvel's Jessica Jones as the mind controlling supervillain Kilgrave exclusively on Netflix. There's a number of Jessica Jones Tees on offer this weekend. They're just $14 / £9 for a tee Also available as * Hoodies $35 / £23 * Baseball Shirts $20 / £13 * Phone Covers $18 / £12 * Art Prints $8 / £4 Ships worldwide from the USA. 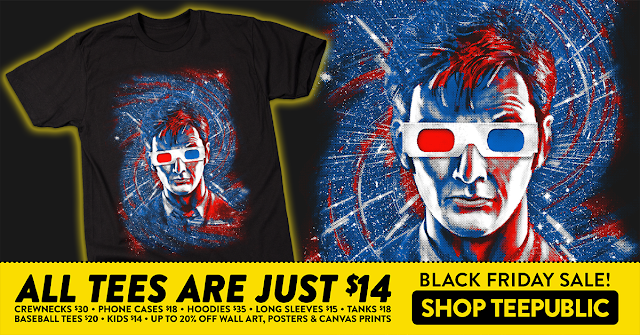 TeeFury have got a site wide sale on 1000s of Doctor Who tees just $14 / £9 from h Also available: * Doctor Who Hoodies $35 / £23 * Doctor Who Baseball Shirts $20 / £13 * Doctor Who Phone Covers $18 / £12 * Doctor Who Kids Tees $14 / £9 PLUS 20% OFF ALL DOCTOR WHO POSTERS, WALL ART AND CANVASES Ships worldwide from the USA! CLICK HERE TO BROWSE! UK based company Aplentee have a huge sale on with 50% off all full priced Doctor Who shirts Enter Code: BF50 to get your tees HALF PRICE! SALE ENDS 1 DECEMBER! Tees ship worldwide from the UK! CLICK HERE TO BROWSE! There's a mega Doctor Who sale at Whovian Shirts and a FREE WHOVIAN MOUSEPAD WITH EVERY ORDER $9 / £6 tees and $22 / £14 hoodies Sale ends 2 December Worldwide shipping CLICK HERE TO BROWSE! 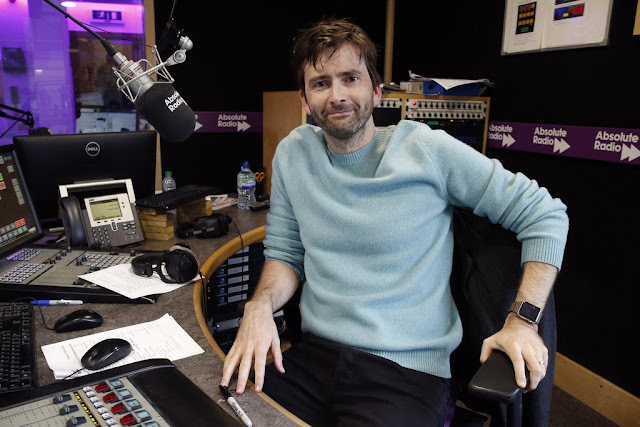 Absolute Radio have today confirmed that David Tennant will be taking part in this year's Christmas panto Star Clause: Snow Hope. The no doubt high class dramatic event will be performed on Friday 18th December during the Christian O'Connell Breakfast Show. You can listen in on 105.8FM in London and the South-East, nationally on DAB or 1215AM, via mobile apps and digital TV or online at http://www.absoluteradio.co.uk/. REVIEW: Marvel's Jessica Jones Episode 3 - AKA It's Called Whiskey: "I Wasn't Strong Enough"
In Episode 3 of Marvel’s Jessica Jones – AKA It’s Called Whiskey, Jessica and Kilgrave continue their dangerous game of cat and mouse, Jessica discovers she has another superpowered ally and Hope’s innocence is publically called into question by someone she thought was on her side. As always, this review will include spoilers so please be cautious if you have not yet watched the episode. The second season of the award-winning UK TV series Broadchurch will be added to Netflix in the USA from Tuesday 1st December. 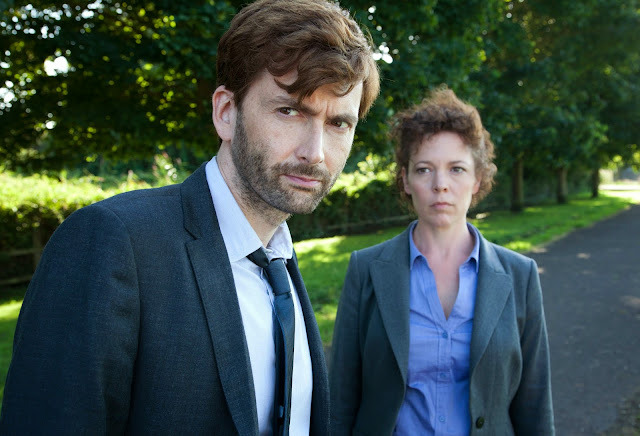 The gripping crime drama which premiered on ITV in the UK in January and on BBC America in the USA in March sees the return of David Tennant and Olivia Colman in the roles of Detectives Alec Hardy and Ellie Miller. The new season continues to explore the after-effects of a brutal murder in a small town as young Danny Latimer's killer goes to trial. Meanwhile there are new developments in an old case that has haunted Hardy for some time, and he begs his former colleague Ellie Miller to help him finally crack the case. Other familiar faces this season include Arthur Darvill, Jodie Whittaker and Andrew Buchan, while a number of new names join the impressive ensemble cast - Charlotte Rampling, Eve Myles, Marianne Jean-Baptiste and James D'Arcy all play key roles. There's just under a month to go until Christmas, so here's the first of our Festive Throwback Thursdays, taking a look at some of David Tennant's Christmas projects. 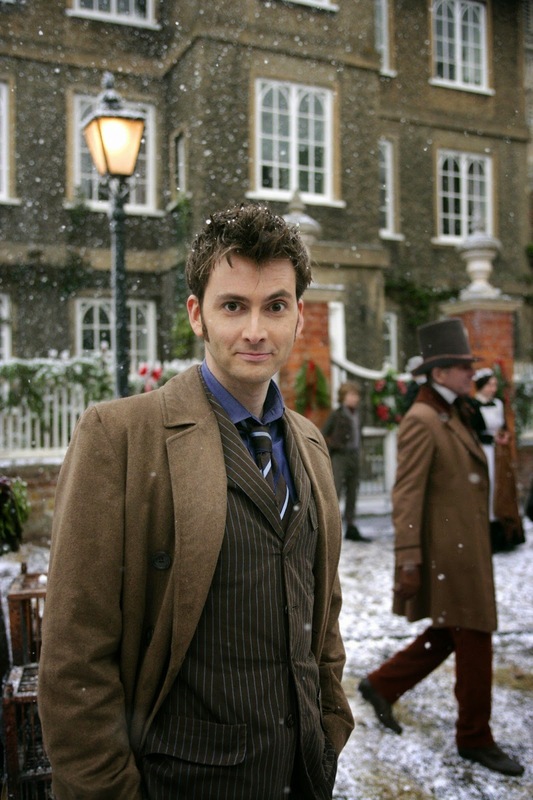 The first in the series is the Doctor Who 2008 Christmas special, The Next Doctor, which co-starred David Morrissey, Velile Tshabalala and Dervla Kirwan. At the time of broadcast, David's step-down from Doctor Who had just been announced and there was much speculation that this episode would be his last; in fact he had a year of specials to go. The Royal Shakespeare Company has announced the cast for the staging of Richard II at the Barbican Theatre in London in January 2016. 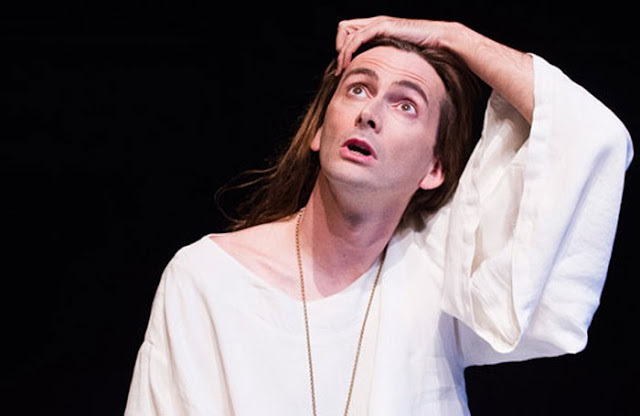 The production sees David Tennant reprise his role as the King as the play is performed as part of the RSC's four play Great Cycle Of Kings. Those familiar with the 2013 production of the play in Stratford-upon-Avon and London will recognise a number of familiar names among the cast list. There are also notable changes. Jasper Britton takes over the role of Bolinbroke from Nigel Lindsay, also playing the part of the King in Henry IV Parts 1&2. Julian Glover replaces Michael Pennington as John Of Gaunt and Sam Marks steps up into the role of Aumerle, previously played by Oliver Rix. 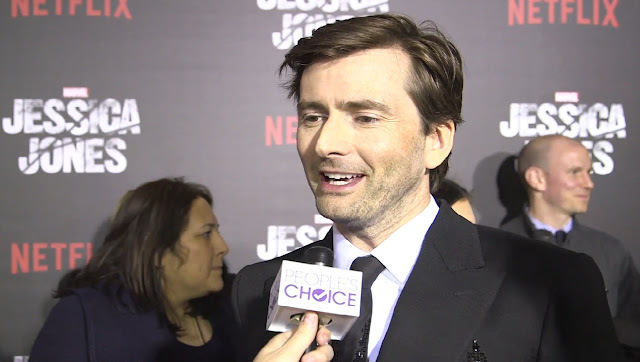 David Tennant spoke to Peoples Choice on the purple carpet at the world premiere of Marvel's Jessica Jones in New York last week, The thirteen part series enjoyed a star studded launch event, attended by all key cast members ahead of its worldwide launch on Netflix last Friday. David first considered the challenge of playing the villain. He stars as Kilgrave in Jessica Jones, a monstrous individual with little regard for the lives of others, and the titular Jessica's tormentor. "It's great to walk in many different alleys," he said. "If it's a good script, whether it's heroes or villains or anything else, that's the challenge and that's what you look forward to." He was also asked to name his favourite episode of the season. David had not the completed episode at that point, but based on the script alone he nominated episode 9, AKA Sin Bin. "The story takes such a left turn and it's so brilliantly written," he explained.